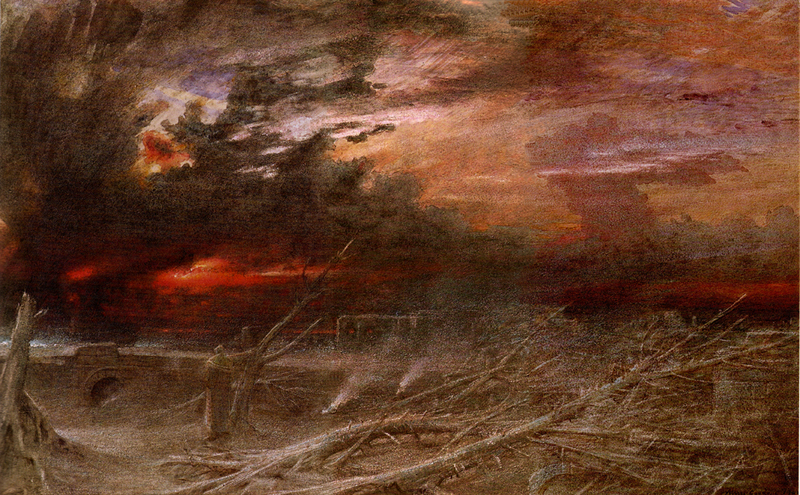 In religious contexts, an apocalypse is a disclosure of something hidden, “a vision of heavenly secrets that can make sense of earthly realities”. Part of the development of a new book project, this article retraces some of the origins of the Apocalypse, going back in time to the deeds of Sargon, the fate of the Sumerians, collapse and the onset of a forgotten Dark Age as precursors for later tales we know from Exodus. Many know of the Apocalypse from the Four Horsemen of the Apocalypse – described in the last book of the New Testament of the Bible, called the Book of Revelation of Jesus Christ to John of Patmos, at 6:1-8. The chapter tells of a book or scroll in God’s right hand that is sealed with seven seals. The Lamb of God opens the first four of the seven seals, which summons four beings that ride out on white, red, black, and pale horses. Though theologians and popular culture differ on the first Horseman, the four riders are often seen as symbolizing Conquest or Pestilence, War, Famine, and Death. The Christian apocalyptic vision is that the Four Horsemen are to set a divine apocalypse upon the world as harbingers of the Last Judgment. 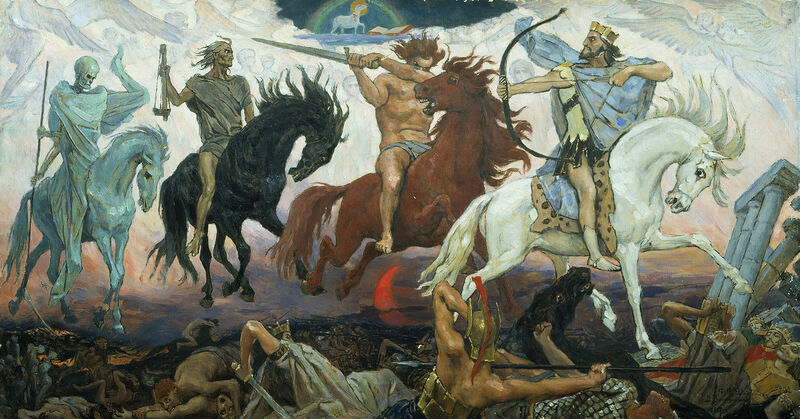 One reading ties the Four Horsemen to the history of the Roman Empire subsequent to the era in which the Book of Revelation was written, being a symbolic prophecy of the subsequent history of the Empire. “Set me in a basket of rushes and sealed my lid with bitumen/ She cast me into the river which rose over me. The river bore me up and carried me to Akki, the drawer of water. Akki, the drawer of water, took me as his son and reared me. Akki/the drawer of water, appointed me as his gardener” (Pritchard, 85-86). Sargon grows up to overthrow the king and unite the region of Mesopotamia under his rule. Scientists have proven that Sumeria’s collapse in 2024 BC was caused by an abrupt unexplained climate change that brought wind-blown dust storms dated by radiocarbon dating to 4025 years ago +– 125 yrs. A study by Harvey Weiss and Timothy Wieskel of the Harvard University and HM Cullen and Lamont-Doherty at the Earth Observatory at Columbia University corroborate the dates. The ancient text the Erra Epos details the age of conflict between Lord Marduk, son of Lord Enki and the other gods called the Anunnaki ‘those who came from heaven to Earth’, in a conflict in Marduk’s bid to become the supreme ruler of Earth. Erra (sometimes called Irra) is an Akkadian plague god known from an ‘epos’ of the eighth century BCE. Erra is the god of mayhem and pestilence who is responsible for periods of political confusion. In the epic that is given the modern title Erra, the writer Kabti-ilani-Marduk, a descendant, he says, of Dabibi, presents himself in a colophon following the text as simply the transcriber of a visionary dream in which Erra himself revealed the text. The poem opens with an invocation. The god Erra is sleeping fitfully with his consort (identified with Mamītum and not with the mother goddess Mami) but is roused by his advisor Išum and the Seven (Sibitti or Sebetti), who are the sons of heaven and earth —”champions without peer” —each assigned a destructive destiny by Anu. The Sibitti call on Erra to lead the destruction of mankind. Išum tries to mollify Erra’s wakened violence, to no avail. Foreign peoples invade Babylonia, but are struck down by plague. Even Marduk, the patron of Babylon, relinquishes his throne to Erra for a time. Tablets II and III are occupied with a debate between Erra and Išum. Erra goes to battle in Babylon, Sippar, Uruk, Dūr-Kurigalzu and Dēr. The world is turned upside down: righteous and unrighteous are killed alike. Erra orders Išum to complete the work by defeating Babylon’s enemies. Then the god withdraws to his own seat in Emeslam with the terrifying Seven, and mankind is saved. A propitiatory prayer ends the work. The poem was central to Babylonian culture, with at least thirty-six copies recovered from five first-millennium sites—Assur, Babylon, Nineveh, Sultantepe and Ur—more, even, as the assyriologist and historian of religions Luigi Giovanni Cagni points out, than have been recovered of the Epic of Gilgamesh. The text appears to some readers to be a mythologisation of historic turmoil in Mesopotamia, though scholars disagree as to the historic events that inspired the poem: the poet exclaims (tablet IV:3) “You changed out of your divinity and made yourself like a man.” The Erra text soon assumed magical functions. Parts of the text were inscribed on amulets employed for exorcism and as a prophylactic against the plague. The Seven are known from a range of Akkadian incantation texts: their demonic names vary, but their number, seven, is invariable. According to the Jewish Encyclopedia, “In Chaldean mythology the seven evil deities were known as shedu, storm-demons, represented in ox-like form.” They were represented as winged bulls, derived from the colossal bulls used as protective jinn of royal palaces. There are indications that demons in popular Hebrew mythology were believed to come from the nether world. Various diseases and ailments were ascribed to them, particularly those affecting the brain and those of internal nature, including a demon of blindness, “Shabriri” (lit. “dazzling glare”) who rested on uncovered water at night and blinded those who drank from it. Other demons supposedly entered the body and caused the disease while overwhelming or “seizing” the victim. To cure such diseases, it was necessary to draw out the evil demons by certain incantations and talismanic performances, at which the Essenes excelled. Josephus, who spoke of demons as “spirits of the wicked which enter into men that are alive and kill them”, but which could be driven out by a certain root, witnessed such a performance in the presence of the Emperor Vespasian and ascribed its origin to King Solomon. In mythology, there were few defences against Babylonian demons. The mythical mace Sharur had the power to slay demons such as Asag, a legendary gallu or edimmu of hideous strength. The Early Bronze Age Collapse. This is the time of the writing of the Epic of Gilgamesh after (recording) the Great Flood. This entry was posted in Ancient Beliefs, Ancient Places, Esoteric Belief, Gods, Historical Cultures, Myths, The Seven, Timelines and tagged Apocalypse, Demonology, Gods, Historical people, Origins. Bookmark the permalink.